Man wearing multiple necklaces. 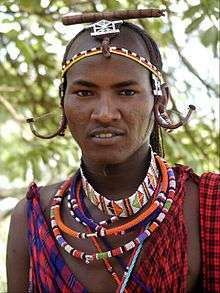 The Maasai of Kenya, Africa use necklaces as part of traditional attire. Necklaces are worn by both men and women in cultures around the world for purposes of adornment and social status. However, in Western society, the word necklace in English often carries a female connotation. Men in Western countries often call their neck jewelry chains instead. Necklaces have been an integral part of jewelry since the time of ancient civilizations and pre-date the invention of writing. During the neolithic period shell necklaces were made with the shells of 3 genera Spondylus, Glycymeris and Charonia. Cloth working and metalworking greatly expanded the range of jewelry available to humans. Twine and string enabled the development of smaller, more durable, more intricate necklaces. After the Bronze Age began and humans discovered how to melt metal and cast it into shapes, bronze, copper, silver, gold, electrum, platinum and a variety of other metals were used to make eye-catching necklaces for both men and women, and metal chains became possible. Gemcutting and glassblowing allowed faceted and highly polished gemstones and/or beautiful art glass to be added to pieces. In the modern era, a variety of new metals are available for necklaces that earlier generations could not properly melt until high-temperature crucibles and blowtorches were developed, such as stainless steel and titanium; electroplating has enabled mass ownership of gold (or at least gold-veneer) jewelry. Miniaturisation and laser etching enable the crafting of finely detailed artwork, or insignias or other calligraphy, within individual necklace elements. Girl wearing a necklace. This type of metal fashion necklace is common in Europe and the Americas. A necklace featuring a Christian cross. A diamond necklace is a necklace that incorporates diamonds — they are often given as gifts in Western countries as signs of love and fealty between wealthy lovers or families. There are a variety of diamond necklaces available to the average consumer including the diamond eternity necklace, the diamond 'V' necklace, the diamond 'Y' necklace and the diamonds by the yard necklace. A necklace with customizable engraved street intersections of any place in the world bearing a diamond located at the exact point where the couple met or proposed. Map necklaces are available in round, rectangular and heart shapes as well as in gold, white, rose gold and sterling silver metal. Additional message or map can be engraved on the back of the pendant. 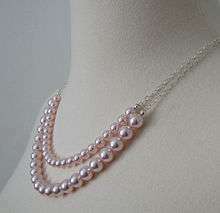 Pearl necklaces are popular among women. There are two specific named kinds of pearl necklaces — a uniform pearl necklace consists of pearls that appear to be all the same size, although normally there is a slight difference towards the ends so they appear to be in proportion. A bib necklace is made of multiple strands of stepped pearls. Many other variations also exist. Some men's necklaces (and a few women's) attach an animal tooth as the pendant portion. A particularly popular variant is a leather string necklace with a shark tooth attached. A long, beaded necklace typically in the form of a wide lasso, usually with a religious symbol (the cross for Christian prayer beads) at the end of the lasso. The beads can be made of simple wood, metal, gems or even plastic, with each bead representing a prayer for the wearer to recite. The different sizes and/or colours of the beads typically represent which prayer is to be recited when that bead is reached. A rivière necklace is a style of necklace featuring a single strand of gemstones of the same general size and cut. Wikimedia Commons has media related to Necklaces. ↑ Gardelková-Vrtelová, Anna; Golej, Marián (2013). "The necklace from the Strážnice site in the Hodonín district (Czech Republic). A contribution on the subject of Spondylus jewellery in the Neolithic". Documenta Praehistorica. Znanstvena založba Filozofske fakultete Univerze v Ljubljani. 40: 265–277. doi:10.4312/dp.40.21. Retrieved 2 December 2015. ↑ "Map Necklace & Pendant by A.Jaffe". www.ajaffe.com. Retrieved 2016-09-21. 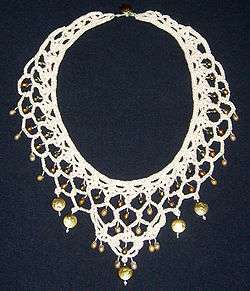 Look up necklace in Wiktionary, the free dictionary.